Beside cooking and photographing (in fact, these are two of my newer hobbies) I like running. I started off with just short distances up to 5km, just jogging for myself. Soon I participated in 10k runs. By now I have done a couple of half marathons. Anyway, now I have this idea in my head of running my first full marathon. I am fancying the Paris Marathon in April 2010. I think Paris is just good enough to run my debut marathon in, and the event is quite big (with a limit of 40.000 runners or so). I hope that the masses will pull me through. So far, my longest ever run distance was something around 25km. I am already checking marathon training plans and marathon nutrition tips. Wherever I come across the word marathon, I'll check if I can't find some secret that will help me prepare for the big event. 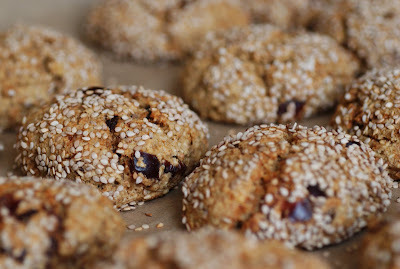 On 101 cookbooks, a food blog that I love and visit very regularly, I found these cookies that were called Marathon Cookies. The ingredients of the cookies were awkward at first sight: white beans (!!!!! ), aniseed, sesame. Yet, it made me curious and within a few days I had baked them at home and got approval from my husband for them. Fact is, you do not taste the beans at all, but you have all the goodness of them in the cookie. I don't really want to call them marathon cookies since there is no relation between my marathon plans and the cookies (yet). I also didn't want to mention the beans in the headline: not so sure if people would be attracted by White Bean Cookies. I chose to name them after the flavor ingredients: aniseed and sesame. Pulse the oats in a food processor until they have the texture of flour. In a mixing bowl mix the oats with the flour, aniseed, baking powder, baking soda, lemon zest and salt. Pulse the beans/chickpeas, olive oil, sugar, egg, and vanilla extract in the food processor to a smooth and creamy paste. Combine wet ingredients with the dry ingredients. Stir the dates into the batter. Place the sesames seeds in a bowl or a deep plate. Make each cookie out of a golf ball size amount of dough. Roll each scoop of dough into a ball then coat it with sesame seeds. Line a baking sheet with parchment paper and put the sesame coated balls on the sheet, flattening each ball a little (so it gets the shape of an ice-hockey puck). Leave some space between the cookies on the baking sheet. They spread a little while baking. Put the sheet in the upper third of the oven. Bake for about 15 minutes or until the sesame seeds around the bottom start to get golden.